Taylor Trammell, Mount Paran Christian (Kennesaw). RB 6’2” 195lbs. Trammell had a monster game against Pinecrest Academy where he ran for 346 yards and 3 TDs. This puts his total rushing yards, as of week 5 of the season, at a state leading 119 rushes for 1,110 yards and 17 TDs. As if that weren’t enough, on the defensive side of the ball he is a standout FS having intercepted 2 passes for his undefeated Mount Paran Christian Eagles. All the more impressive is that football may not be his best sport. He is an Under Armour All American Outfielder in Baseball and has committed to play baseball for Georgia Tech in 2017. 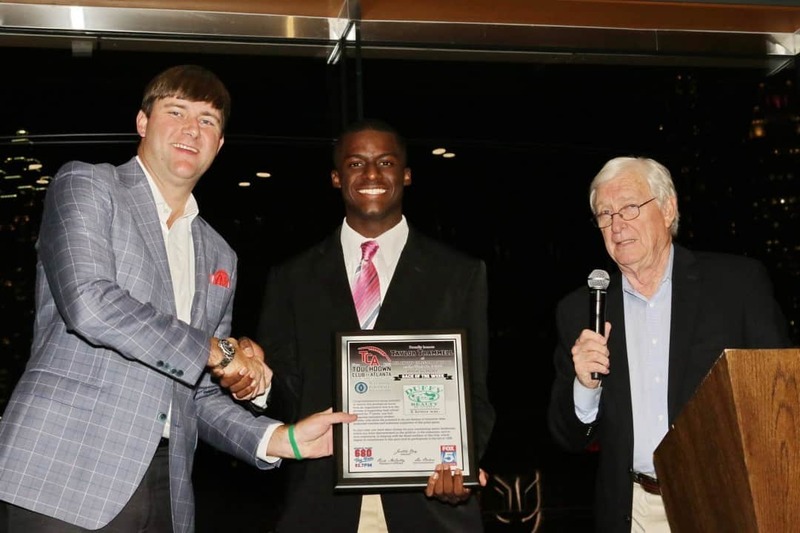 For Taylor’s outstanding performance we congratulate him for being our Touchdown Club of Atlanta Back of the Week.